Thanks to the evaporative cooling power of Handy Cooler™, cool air is collected in a flexible air tube which reaches into the seating area of the stroller. Handy Cooler™ is placed in a dedicated pouch of the universal organizer included. 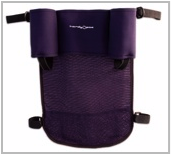 The organizer is fitted with two velcro straps which secure onto the two handles of the stroller. The system draws FRESH air from outside and delivers cool air to your little one! A simple yet smart innovation. Treat your most loved ones. 3 SIMPLE STEPS TO INSTALL! 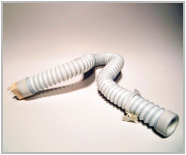 Bend the air tube into the stroller seat! Close the hood and you create a little air-conditioned seating area! Say goodbye to poor air circulation and hot sweaty backs of your little ones in the stroller. On hot summer days, it can get really hot in a baby stroller. Not only uncomfortable, it can be dangerous when insufficient fresh air circulates in a baby stroller with a closed hood. Leaving overheated children in hot strollers can lead to cot death. Many parents avoid taking their young ones to the park or outdoor events in summer. Now this baby stroller air cooling product can change your life! This baby stroller stroller air conditioning system not only cools the air down before it reaches into the seating area of your baby, but it draws in fresh air from outside. This ensures a healthy circulation of cool fresh air. Best for kid strollers, jogging strollers, and conventional strollers. An all new baby stroller accessory that your loved one needs on a hot summer day! *Designed to fit on all strollers. 1x small compartment for wallet/phone. 1x slot for Handy Cooler™. 4x velcro straps with fish-hooks to stabilize on stroller.